Learn how to gift wrap a box. It’s really quite easy. Unroll your wrapping paper enough to cut a piece that will overlap by a few inches when you wrap it around the box. To make sure you have enough paper for the ends, add the height of one end plus 4 or 5 inches, to the length of the box. 1. Lay the paper with the decorated side down. 2. Lay the box upside down exactly (you can eyeball it) in the center of the paper. 3. Fold 1/2 inch or so under on the long edge of one side of the paper and crease it. This makes a nice looking edge and helps prevent tearing. 4. Pull the uncreased edge of the paper up over the box onto the center of the box bottom and use a small piece of tape to hold it in place. 5. Snuggly, but gently, pull the folded edge of the paper to the box bottom and overlap the first edge. Tape in place. You can use double sided tape if you don’t want your tape to show. If the box is fairly large, use 1 piece of tape in the center, and add tape close to both ends as well – staying on the box and not taping down over the ends. 6. Starting on one end, fold both sides in neatly and crease slightly on the edges. 7. Fold the bottom edge of the end paper (which is actually on top, as the box is still upside down) down over the sides. Fold the other point under slightly and crease. Then pull it over the first point, creasing the edges of the triangles made in the paper. 8. Repeat with the other end. 9. 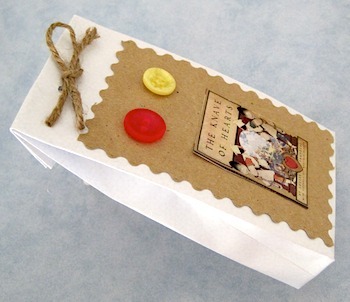 Turn the package right side up and add ribbon, twine, a bow, or other decorations. It’s quick and fun to know how to gift wrap a box.